It is important for professionals who provide medical, rehabilitation, educational, and community services for children and youth with cerebral palsy to provide a quality medical home, family-centered, and needs-based services to address their needs and improve child and family well-being. Knowledge regarding determinants and unique profiles of needs for families of children and youth with cerebral palsy is limited. 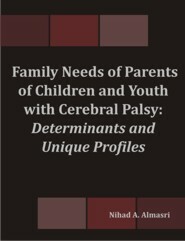 The aims of this research were to (1) test structural equation models of determinants of three types of family needs of parents of children and youth with cerebral palsy; (2) identify and describe unique profiles of family needs; and (3) examine whether profiles of needs are differentiated based on child, family, and service characteristics. Participants were 579 parents of children and youth with cerebral palsy. Children/youth and their parents completed a modified version of the Family Needs Survey, Family Environment Scale, Coping Inventory, Children's Assessment of Participation and Enjoyment, Measure of Processes of Care, and Services questionnaire. Research assistants determined the Gross Motor Function Classification System levels of the children. The structural models explained 23% of variance in needs related to child condition, 43% of variance in needs related to community and financial resources, and 33% of variance in needs related to family functioning. The determinants of the three models included different combinations of services (accessibility, coordination, processes), family (relationships, income), and child (gross motor function, adaptive behavior, communication problems) characteristics. K-means cluster analysis indicated four unique profiles of needs: Low Needs, Needs Related to Child Health Condition, Needs Related to Community and Financial Resources, and High Needs. Profile membership was differentiated based on child gross motor function and adaptive behavior, family relationships and income, and access to and coordination of services. Families who were included in the profile of low needs commonly reported accessible, coordinated, and family-centered care. The results emphasize the importance of providing medical and family-centered services to address the unique needs of families of children and youth with cerebral palsy. Service providers are encouraged to engage families in expressing their needs, collaborate with families in identifying resources to meet needs, and guide families in navigating complex service systems to address needs. Nihad Almasri, PT, PhD is a Pediatric Physical Therapist. She will join the University of Jordan as an Assistant Professor in the faculty of Rehabilitation Sciences-Department of Physical Therapy, Amman, Jordan in October 2010. She received her BS in Phsyical Therapy from the University of Jordan in 2003, her MS in Rehabilitation Sciences from the University of Pittsburgh, Pittsburgh, PA, USA in 2006, and her PhD from Drexel University, Philadelphia, PA, USA in 2010. Her research interests include understanding family needs of parents who have children/youth with cerebral palsy. Dr. Almasri has presented her work in national and international conferences. During her PhD work (2006-2010), she was involved as a research assistant in two multi-site projects related to activity and participation of children with cerebral palsy funded by Shriners Research Foundation, and the determinants of motor abilities, self-care, and play of young children with cerebral palsy funded by the National Institute of Disability Rehabilitation Research (USA) and the Canadian Institutes of Health Research. She was a teaching and research assistant in the University of Jordan-Faculty of Rehabilitation Sciences (2003-2005). She is an active member in the American Physical Therapy Association Section on Pediatrics since 2006, and in the Jordaninan Association of Physical Therapy since 2003.